While the blogosphere is still mourning Australia's great-great-grandmother Olive Riley, the world's oldest blogger, who died on July 15, aged 108, her scribe, Mike Rubbo, has discovered an even older blogger. Ruth Hamilton, of Orlando, Fla., USA, passed away on Jan. 18, three months before what would have been her 110th birthday. Her blogs were videos, posted on a little-known Web site, GrowingBolder.com, whose executive vice president, Bill Shafer, had known her for years. Just as Olive had a helper in the form of Mike Rubbo to post her blog, Ruth received help and encouragement from Shafer, who wrote a moving eulogy. For the first time in 109 years, 9 months and 5 days, Ruth 1898 is not on this earth. The oldest blogger in the world quietly slipped away. Her mind was crisp and clear to the very end. 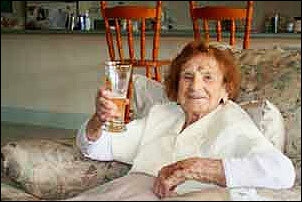 It's not often you can say a 109 year old left this earth too soon, it's true with Ruth. She was sharp, quick-witted and simply charming. Things changed overnight. She awoke with a bad headache. She hurt to the touch. She didn't want to get out of bed. This went on for nearly two weeks. It was very different from her usual routine. Most mornings she was early to rise. She loved to gaze out her bedroom window, watch the sun come up and trace the clouds that would float across the skies of a new day. To Ruth, each day was a wonder to behold. Her curiosity would shine as bright as the morning sky. Ruth believed her sense of wonder kept her alive. She had always thrived on learning. Not so much so she could know, but so she could teach. Teaching was her purpose in life. And she'd been at it for a very long time. She first became a teacher in 1916 in a country schoolhouse in Iowa. As technology evolved, so did Ruth! When radio became popular, she found a way to use it to teach. Ruth was one of the first women to host her own show in New York, on which she taught speech, elocution and English. She moved to Los Angeles in the late 30's where she taught diction to Hollywood starlets. She even taught in the political arena, becoming the first woman elected to the legislature in New Hampshire. She taught through the newspaper, writing articles, travelogues and letters to the editor. She even used her own life as an example, writing a no-holds barred 500-page autobiography, "The Hamilton Saga". And finally, she taught over the internet. The years flew by. She was in her mid 90's when this fiercely independent woman decided it would be best to move into an assisted living facility. She sadly believed her days of teaching had come to an end. This woman who routinely traveled the world now seldom left her building. The walls closed in on her. She had no purpose, no voice, no passion. I saw this happen to Ruth and it was painful to watch. Until something amazing happened. Marc Middleton and I started work on GrowingBolder.com, a web site dedicated to shining a light on the biggest change in the history of mankind, the age revolution. Life doesn't start a downward slide at 50 anymore. Our site celebrates the new reality, the new possibilities and the new potential. It struck me that Ruth would be a great role model! I knew she would love the life-affirming, motivating content we created. Did she ever! Almost instantly, her spark for life reignited. The computer was her stage. The whole world could be her audience. She got right to it. She filed dozens of video blogs at GrowingBolder.com. The internet had given her voice back. And what a wonderful voice! 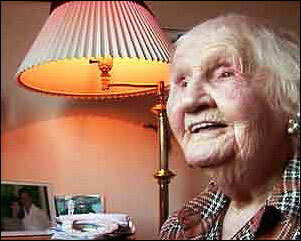 A woman born in 1898 was now an internet pioneer. She was, in fact, the oldest blogger in the world. She even started getting fan mail from users who sought out her advice. Oh, did she love that! Her final wish was that you would continue to watch her blogs, enjoy, find inspiration and learn from them. What a wonderful gift they are from a woman born of another time, who wanted most of all to help make a difference. Through them, her wit, wisdom and curiosity will live on even longer than her 109 years on earth. Ruth Hamilton (109). Photo courtesy of GrowingBolder.com. You can listen to Ruth's videos by clicking on her GrowingBolder.com Web page. And Olive's YouTube videos are listed on this site. Now that Ruth and Olive are no more, the latest World's Oldest Blogger seems to be Californian centenarian Frank Pelatowski, who calls himself the World's Oldest Newspaper Columnist. Frank, who lives in a nursing home in Merced, Calif., near Yosemite National Park, writes an entertaining weekly column for his local newspaper, the Mariposa Gazette. I'm 100 years old. That makes me the world's oldest newspaper column writer. In about 80 years as a writer, I have probably written millions of words, including hundreds of newspaper columns. I've written books for children and have two or three other manuscripts underway. I hope to publish my new book, The Wit and Wisdom of Frank V. Pelatowski -- The World's Oldest Newspaper Columnist, later this year (2008). I was born in Massachusetts and grew up in Connecticut. I joined the navy at age 16 (in 1923) and was called back into service for World War II. I've been married twice, both wives died while married to me. I have no children, but consider many children to be like grandchildren to me. I live in California and still get around pretty well, considering my age. Sadly, his friend David Burke reports that Frank, who will turn 101 next Sunday (Aug. 10) is "under the weather." His blog was last updated on May 4.